Raphael Patai Series in Jewish Folklore and A, 9780814327722, 336pp. 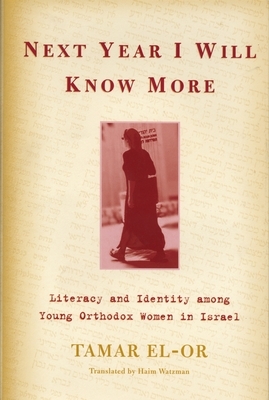 In traditional Jewish societies of previous centuries, literacy education was mostly a male prerogative. Even more recently, women have not been taught the traditional male curriculum that includes the Talmud and midrashic books. But the situation is changing, partly because of the special emphasis that modern Judaism places on learning its philosophy and traditions and on broadening its circle of knowers. In Next Year I Will Know More, the distinguished Israeli anthropologist Tamar El-Or explores the spreading practice of intensive Judaic studies among women in the religious Zionist community. Feminist literacy, notes El-Or, will alter gender relations and the construction of gender identities of the members of the religious community. This in turn could effect changes in Jewish theology and law. In an engaging narrative that offers rare insights into a traditional society in the midst of a modern world, the author points to a community that will be more feminist--and even more religious.